One of the author's pinboards shows how Pinterest's visual organization works. Use specific search keywords: Pinterest already has “education” as one of its search categories, but clicking this will produce a random assortment of pins tagged for education. Instead, use the search bar to look up specific topics such as “STEM”, “math apps,” or “ancient Egypt.” No matter what the subject, you are bound to find some ideas. Create a bookshelf: Share favorite books with colleges or students. Administrators can create a professional reading list and use the caption tool to give a quick summary of each book. Collaborate with colleagues: Pinterest allows for group boards, meaning more than one pinner can pin to the same place. This feature enables whole departments to pin new ideas to a collaborative board. Pinning links to a group board can make it easier to collect resources for multimedia text sets. 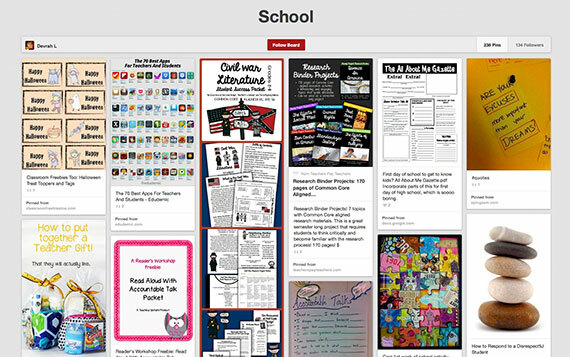 Link a blog or Teachers Pay Teachers account: Pinterest is not just for getting ideas, it’s also for sharing. You can add a button to your teaching blog or pin from your TPT account to allow others to save the great ideas you are creating. Create a PLN: You don’t have to work at the same school (or even in the same state) with amazing teachers to get ideas from them. Following other teachers who teach the same subjects as you will give you a chance to check out their blogs and expand your PLN. Provide students a research aid: Students use multiple websites to do research these days, but often, when it comes time to write up their references, they can’t remember where they have been searching. Students can pin their favorite research sites for easy access. Redecorate your classroom: Never again be at a loss for a door decoration, center arrangement, or holiday decor. Whether you’re looking for new ways of organizing classrooms or ideas for anchor posters, the inspiration is all there. Celebrate: Pinterest has loads of gift ideas to help you celebrate big and little classroom victories, plus ways to thank your parent helpers and others. Devrah Lawver teaches in the San Ramon Valley Unified School District. You can find her on twitter or Pinterest at @dlawvs.